Apologies for the lack of reports this season but to be honest we haven’t had much to report until now. We have suffered like everywhere else in the country and lost most of our summer fishing to the hot weather and lack of rain. We only had a couple of small lifts which brought in a a few smaller fish. We had one fish in June, One in July and seven for August off the back of these small and scarce lifts in water levels, they were not even big enough to be classed as a spate. Thankfull things changed for the better last week. What a difference a proper spate makes. After a much needed six footer on Monday night we finally got our first full week of fishing and managed to land 16 fish and a handful of sea trout. 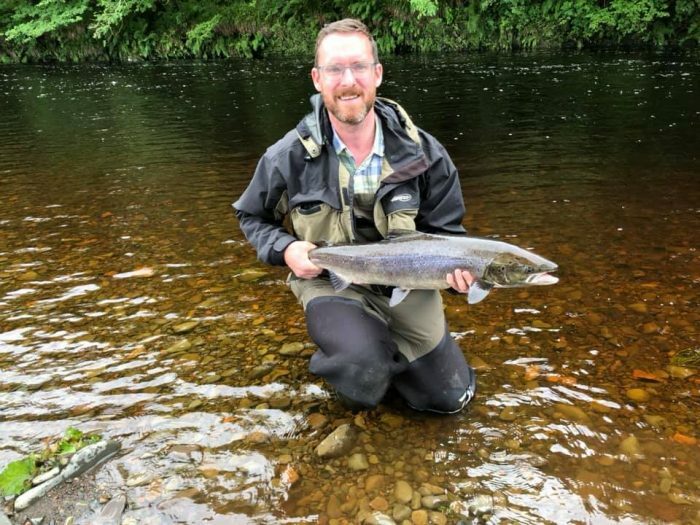 On Tuesday we still had high water but Mike Arnett landed a grilse from the high water hot spot at the tail of the Craig with a sinking line and big junction shrimp. Mike has been fishing the river every year for as long as i have been on this earth so it is always a pleasure to hear tails of days gone by from both Mike and his fishing buddy Neil who spent five days with us this week. On Wednesday the water was falling away nicely but it was obvious that the fish had been running hard when the Almont rods landed 5 while we blanked on Dalreoch. Craig Hopkins had a cracking day landing 3 double figure fish to 15lbs. Ian Maine also had a good day landing 2 fish to 12lbs. Noel Hainey had a grilse on the syndicate water at Bardrochat. 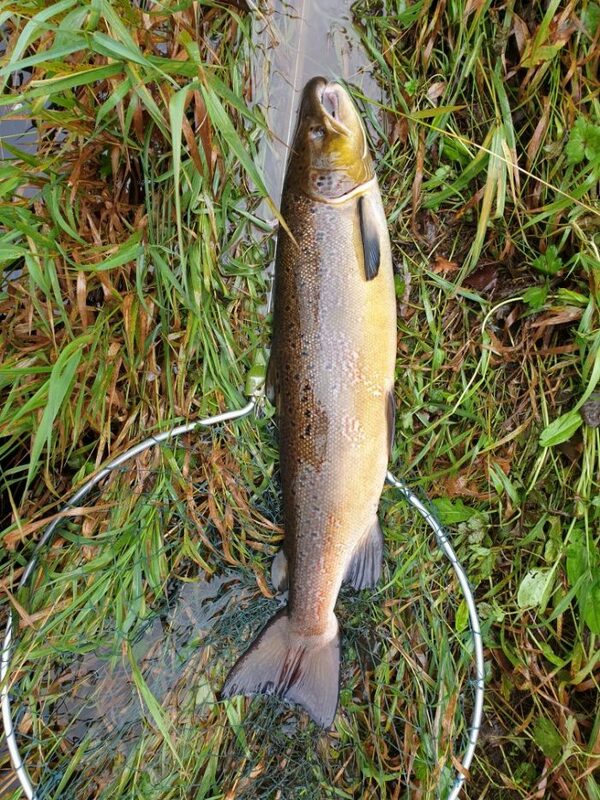 Things settled down again on Thursday and despite our efforts we only landed one fish from Almont for Alan Blair who also had a 2lb sea trout. Friday was quiet again but we still managed a couple of fish. Paul Jervis and his party joined us on Dalreoch for the week and the lads worked extremely hard all week. We were all delighted when Chris landed his first Stinchar fish from Dangart, just what the doctor ordered 🙂. The lads had a great time and i wish them all the best and hope to see them all next year. On Friday, that man Stevie Cope was at it again on Almont landing a grilse and a sea trout. After another decent lift overnight, today we again had a full compliment of rods on. The rods fished hard all day and landed 6 fish to 17lbs. John Horne had 2 double figure fish to 17lbs on Dalreoch. On Almont Wille Peffers and Simon Littlejohn both had a grilse and Lee Conway had a cracking sea trout around 4 1/2lbs on his first visit to the Stinchar. On Bardrochat Stuart Graham had a good day with 2 fish at 5lbs and 10lbs. We have a few rods available next week, for availability please contact Gordon on 07957942317.